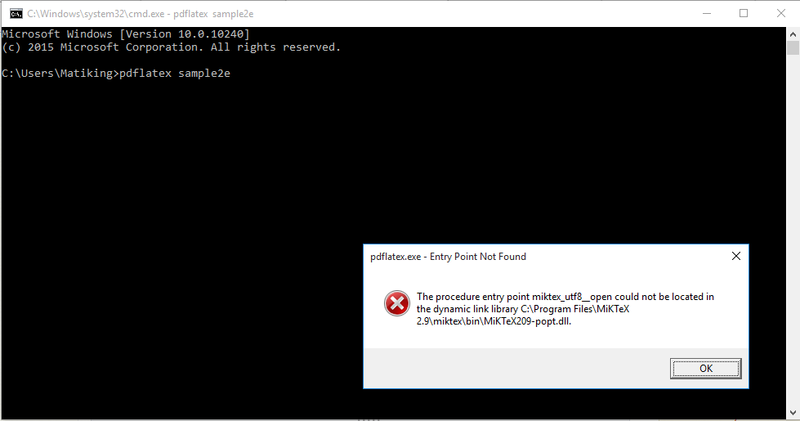 The whole problem started from the point that I wanted to compile something with LuaLaTeX or XeLaTex on my windows 10 from Tex Studio by MikTex 2.9.
installation directory: "C:\Program Files\MiKTeX 2.9"
log4cxx: No appender could be found for logger (mpmcli). Then, as I've found that not only LuaLaTeX and XeLaTeX still don't work, but my pdfLaTeX has been also corrupted and the compiler said: MiKTeX209-jpeg.dll is missing. Based on answers here, I did installed all \Miktex X.X executables (windows-x86) from package manager and even synchronized packages. And as I clicked Yes, nothing happened, but an empty Transcript window. So, I tried the answers of this question, by direct addressing pdfLaTeX from Configure TeX Studio as "C:/Program Files/MiKTeX 2.9/miktex/bin/pdflatex.exe" %.tex. Addition of options -synctex=1 -interaction=nonstopmode to command makes to difference in the error, as well. I suffered the same issue. After uninstalling and reinstalling the miktek-pdftek... packages, I manually copied pdflatex from pdftex using the following command in a terminal (in admin mode). It solved the issue for me. Not the answer you're looking for? Browse other questions tagged miktex windows miktex-update or ask your own question.